Peace on earth goes the old holiday chestnut, and some families take it to heart. pronunciation of “hummus.” For Reem Kassis, author of the cookbook The Palestinian Table, the word starts with something like a sigh, “haahmus”—a lyrical, open-throated hum in Arabic. 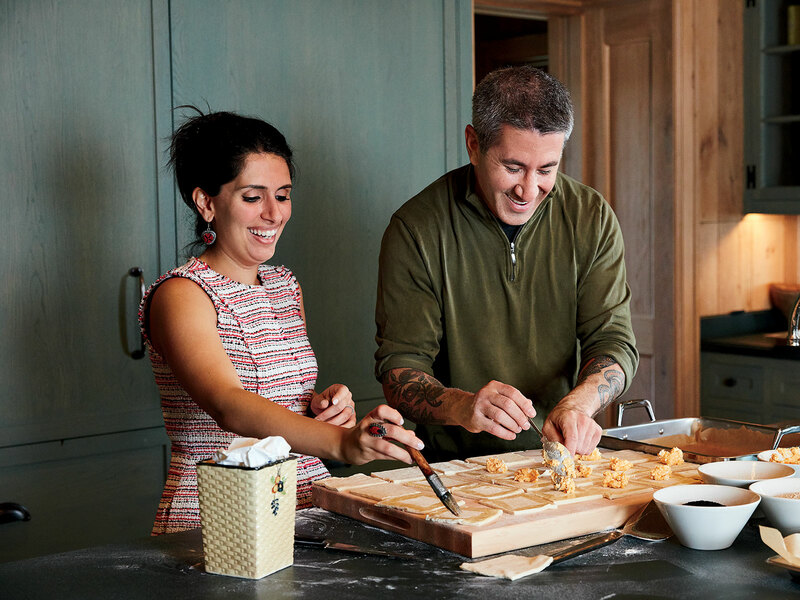 The same word rumbles when it comes from Michael Solomonov, the Israeli chef behind Zahav in Philadelphia. “Chhhhummoooz,” he says, the Hebrew letter heth catching on its way out. There’s a clucking of tongues, two friends pinching a live wire. Is it a hum or a rumble? Palestinian or Israeli? This, of course, will not be resolved today. Kassis and Solomonov are tucked into a breakfast nook at Congdon’s Point, a grand, rambling cabin occupying a notched peninsula on New York’s Shelter Island. It would be glib to say that it feels unlikely to find them at the same table this morning, and maybe too small to say that it feels special. After all, the flavors of their respective cultures may overlap, but that’s a common thread pulled precariously taut. Tug a bit and complicated questions emerge: Where did the culinary traditions of the Middle East come from? How did they get there? Where did they go next? Who owns them? Solomonov received the book the night before he was set to deliver a speech about Israeli cuisine, and it changed his perspective. “I could not look at this person and say, ‘It’s OK for me to have independence as an Israeli, but you cannot,’” he says. “I’d had all these achievements in my career, and I realized that this was by far the most important moment.” From there, something took root. Not diplomacy. Friendship. A year later and here they are at Congdon’s Point, architects of a collaborative holiday feast for their two families. Kassis’ husband, Albert Muaddi, made the trip with their kids, Hala and Yasmeen, plus his brother Jawad with wife, Christine, and daughter Violet. Solomonov brought his sons, David and Lucas, along with friends and collaborators: Dorothy Kalins, who produced his two cookbooks, including the just-released Israeli Soul, and her husband, filmmaker Roger Sherman, who featured the chef in his 2016 documentary In Search of Israeli Cuisine. She drenches cheesy knafeh (shredded phyllo pie) in fragrant orange blossom syrup. He cranks Beck’s Midnite Vultures and rolls out dough for bourekas, savory pastries stuffed with sweet potato and feta. It’s nearly dinnertime, and the lamb is resting, a great glossy haunch on a mountain of hashweh rice. Solomonov breaks off bubble-pocked shards of salty, sizzling fat to crunch while he spoons spicy schug over those short ribs. The clouds are hanging low over Gardiners Bay, filtering the last of the daylight when Solomonov and Kassis bring their showstopping meats to the long table. Kids are squirming; bellies are grumbling. Platters are passed along, dishes are piled high, and no one wonders who made what. Two families around the table tonight. One shared home.